Ugh, the copyright page! Just when you think you can’t handle another detail, you remember that you have to set up your book’s copyright page. Unfortunately you can’t leave the copyright page until the last minute because the process to apply for and obtain the various numbers and information to be included on the page can take a couple of weeks. Below is a handy template to help you sort through the details you need to include on the copyright page, including some suggested legalese. 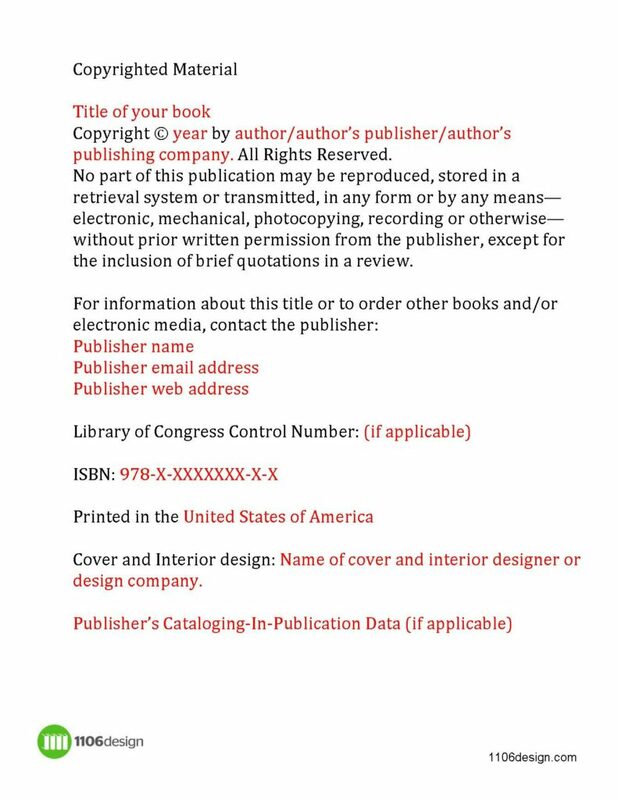 Following the template, you’ll find more detailed information about applying for the ISBN, the Library of Congress Control Number, and the Publisher’s Cataloging-in-Publication Number. Every book that is sold in a retail environment (and that includes online booksellers such as Amazon) needs an ISBN number. These are available from the only source for ISBNs in the United States, RR Bowker, at https://www.myidentifiers.com/cart. We recommend that you purchase a block of ten ISBN numbers. At the current cost of $295, it’s a smart investment as ISBNs never expire. Most authors need at least two ISBNs: one for the print book and another for the eBook. The remaining ISBNs can be used for future editions of this or any other book you publish in the future. Authors who deal with self-publishing companies are often offered a “free” ISBN by the company. This means that the company has purchased blocks of ISBNs and is giving you one of their numbers. This sounds great, but when you see the information that must be submitted at Bowker to obtain an ISBN, you will understand that the self-publishing company will be listed as the publisher of the book and not yourself. In addition, if the company were to go out of business, any control you might have over the ISBN disappears with them. See our blog post on this topic. Bowker also offers barcodes for purchase, which is the ISBN/Price on the back of the cover. If 1106 Design is designing your cover, we will create the barcode as part of the full cover design. The next step is to choose the ISBN that you will assign to the book and include it on the copyright page. Just prior to printing and distributing the book, you will have the necessary information to return to the Bowker website and assign the title to the selected ISBN. This action, along with the information you’ll be asked to provide at that time (i.e., page count, trim size), will list your book accurately in the “Books In Print” database. Bowker’s website can be confusing for newcomers to the industry. At 1106 Design, we can purchase a block of ISBNs for you, in your name, at a 15% discount and complete the title setup on the Bowker website for an additional fee. Before applying for these optional numbers, you should first have your ISBN. 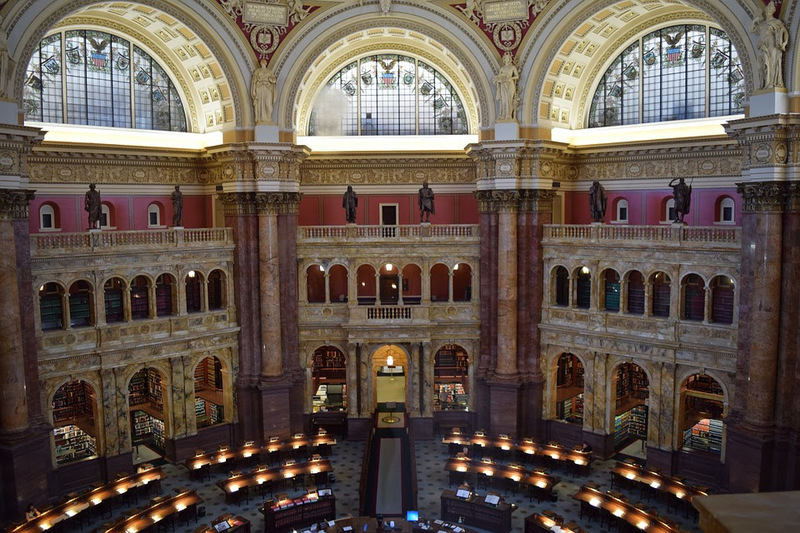 The Library of Congress (LoC) is the main research arm of the U.S. Congress and the home of the U.S. Copyright Office. It is also the largest library in the world, with millions of books and other forms of media. A Library of Congress catalog control number is a unique identification number that the Library of Congress assigns to the catalog record created for each book in its cataloged collections. Upon applying for an LoC number, the LoC will issue you a PCN (Preassigned Control Number) that you put on the copyright page. By printing the PCN on your copyright page, you facilitate cataloging and other book processing activities by the LoC for those publications that may be added to the Library’s collections. The Preassigned Control Number Program is described at www.loc.gov/publish/pcn/. The two-step application process is detailed at www.loc.gov/publish/pcn/about/process.html. Publishers should receive their PCN within two weeks. Only U.S. publishers may participate in the PCN Program. For a list of books that are ineligible for participation in this program, see www.loc.gov/publish/pcn/about/scope.html. Note that eBooks are not eligible. There is no charge for a PCN, but publishers must send a complimentary copy of all books for which a PCN was provided immediately upon publication. Moving on now to the Cataloging-in-Publication data block. The Cataloging-in-Publication data block (also known as a CIP or bibliographic record) is printed on the copyright page of your book. The CIP information makes it easier for libraries to catalog new publications, which means it’s a good idea to have this information in your book. It also makes your book look more professional. There are two avenues to obtaining the CIP data block. One is from the Library of Congress itself, but is only issued to books that they decide to add to their collections. However, the same data block—called the PCIP (Publishers Cataloging-in-Publication)—can be obtained from other sources. The CIP and PCIP are created using the same set of cataloguing rules, but are provided by different agencies. The PCIP can be obtained from The Donohue Group (www.dgiinc.com/pcip/) or Five Rainbows (fiverainbows.com/pcip/).